Photos of humans in Prague. CZ: Do Indie jezdím, protože se mi tam líbí, a v Barmě jsem strávil několik měsíců, abych tam meditoval. Lidi občas ulítávaj ve vyšších čakrách, já si teď spíš uspořádávám praktický život. Některé věci, které tu mám, jsou od Tibeťanů z Dharamsaly, a to tričko je od barmských exilantů v Thajsku. EN: In India I liked it, in Burma I spent several months to meditate. Some people are too much in high chakras, recently, I try to manage my practical life. Some of my things here are from Tibetans in Dharamsala, and the T-shirt from Burmese exiles in Thailand. Young Ukrainian painter Senchuk Liubov introduces her art-work inspired by Maidan. "It came out of strong feelings and the need to express them. There are symbols regarding Ukraine, and the birds refer to the story in Vatikan and the character of Ukraine to fight with evil." * Liubov Senchuk introducing her art-work made out of her experience during the Maidan protests in Kiev, Ukraine, February 2014. Someone is already to buy this collection of her paintings. She is going to make another version, though otherwise she does not make copies of her art. 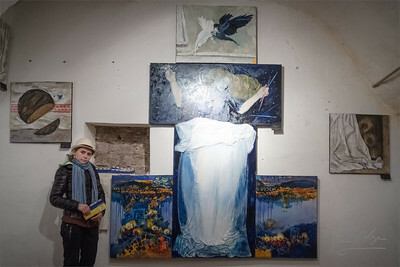 Young Ukrainian painters in Prague. "We wish to finish them today and paint anothers before leaving back to Ukraine next week." 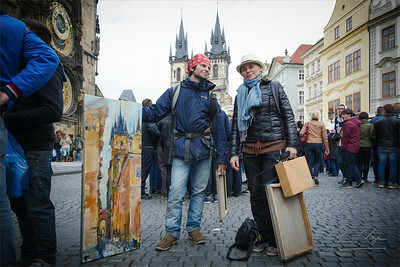 * Ukrainian painters Liubov Senchuk and her partner with their stuff during their stay in Prague, April 2014, to introduce the exhibition Krystalizace, and for plein-air painting. "We want to help visitors to Prague." 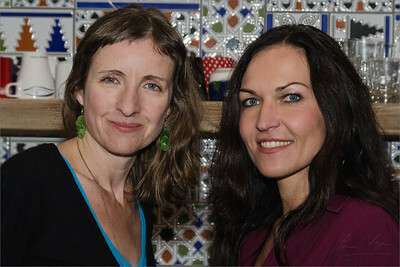 Jitka & Jitka. CZ: Do Indie jezdím, protože se mi tam líbí, a v Barmě jsem strávil několik měsíců, abych tam meditoval. Lidi občas ulítávaj ve vyšších čakrách, já si teď spíš uspořádávám praktický život. Některé věci, které tu mám, jsou od Tibeťanů z Dharamsaly, a to tričko je od barmských exilantů v Thajsku. EN: In India I liked it, in Burma I spent several months to meditate. Some people are too much in high chakras, recently, I try to manage my practical life. 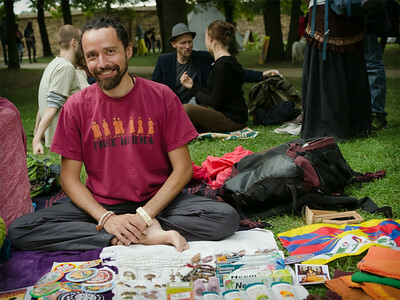 Some of my things here are from Tibetans in Dharamsala, and the T-shirt from Burmese exiles in Thailand.